Recently we have had a surge of ear infection cases with children come into the office so lets talk about ear infections, why they appear and what we can do to make sure they don’t come back. Acute otitis media (middle ear infections) happen when there is an accumulation of water behind the ear drum in an infant or child following a cold or allergic reaction from either bacteria or virus and leave pus and swelling inside it. The Eustachian Tube is the key player in everything because it is responsible for draining the middle ear and everything inside the ear drum. This accumulation causes swelling and is quite painful, hence why the babies cry from it (I would too). There are over 3 million cases per year, and 1/2 the children under the age of 1 will get it, growing to 2/3 of kids being affected by the age of 2. The ear infection happens because there is fluid buildup after an infection do to either dysfunction or blockage of the middle ear. The Atlas or the top bone in the neck can be the cause of this. If you have ever had ear infections yourself or had a child with them, you’ve probably heard the term “tubes” for your ears without knowing really what they are, just that they are used for ear infections. 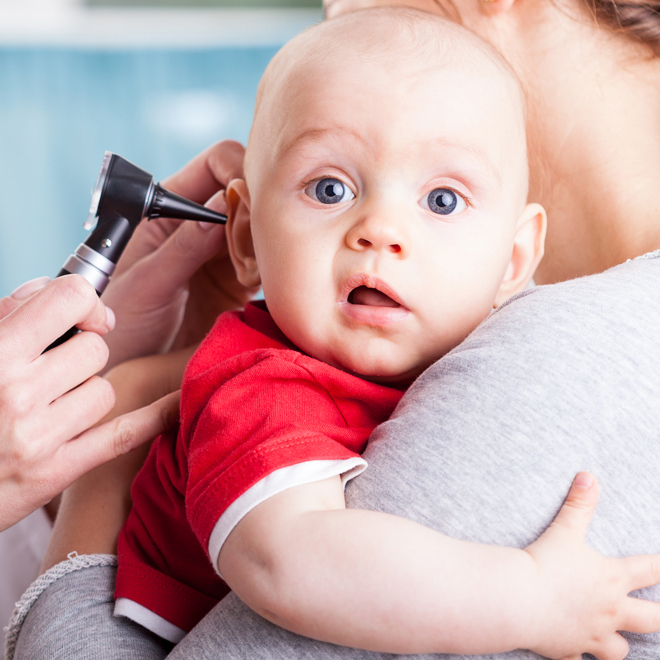 In order to be “eligible” for ear tubes, the child much have had 3 ear infections in 6 months or 4 in 12 months. They do resemble a cross section of a tube from a garden hose, placed in the ear drum and will fall out later in time all by itself. It’s purpose is to regulate air flow to the middle ear, refresh air flow, and drain secretions from the middle ear to take some workload off the Eustachian Tubes. They help to take pressure out of the ear but they don’t stay in and are not solving the problem. Also, there’s also the problem of cost as they will cost anywhere from $2000-3000 without insurance. If you have a $3000 deductible then your’re paying out of pocket for the entire procedure! Then there’s the downside to tube’s in the ear including scarring of the ear drum, the tubes falling out too early or too late, failure of the eardrum to close after the tube is out, and bleeding or infection from the procedure itself. Whether you choose to have the procedure or not, you should still consider the possible ramifications of it should something go wrong. Now, I’m not saying yay or nay to tubes in the ears, but shouldn’t we explore less invasive procedures before more invasive and more expensive first and work our way up? What if we can find a way to no longer have ear infections and pay less and NOT have to put our children in for surgery by the time they’re 1 or 2? The less invasive procedure I was talking about in the last paragraph was chiropractic of course. When the top bone in the neck called the Atlas is out of alignment, either from birth or from turning their head to breastfeed or just moving in general, it can put pressure on the eustachian tubes causing that obstruction mentioned before. When this happens, the fluid cannot drain correctly and the ear infection ensues. The Reason why adults don’t have ear infections is that as an infant your tubes are more horizontal. As we grow and get older the body lengthens and the tubes becomes more vertical and less likely to be obstructed. the issue of the atlas out of place is still there which can cause problems later in life but the ear infections no longer arise. Through chiropractic care for infants, we can move that top bone in their neck back into place very gently and take away the blockage of those tubes and taking away the ear infections. The pressure it takes to do so is no heavier than checking a peach for ripeness, just sustained contact on the bone is all. Plus, chiropractic costs WAY less than the surgical option. We see kids all the time with these same problems that are fixed. Hopefully we can see more to help avoid unnecessary surgery. If you have found usefulness from this article, please share! If you have a kid or know a child suffering, please make an appointment at the link at the bottom of the page! Hopefully this helps you the reader know why they’re there and what you can do to stop them from coming back. If you have any questions, please don’t hesitate to reach out and ask. Our Information is just below on the page. Please like us on Facebook to receive updates and info on how to keep your family healthy and SHARE this post with all you know who have children. Fill out your info for your FREE assessment! We do accept all insurance.Our office is in network with Medicare, United Healthcare, Cigna, Aetna, and a preferred provider in network with BCBS.